1. What has been your favorite place? This is a toughy. Favorite for what reason? The people? The food? Favorite as a place I’d like to visit again or as in a place I could see myself living? If you have been reading lately, then you know that Dubrovnik, Croatia certainly gets top billing when it comes to scenery. And if you’ve spoken to us, you know that Hanoi, Vietnam is a strong contender due to its vibrant nature and the ways it is vastly different from our own lives back home. 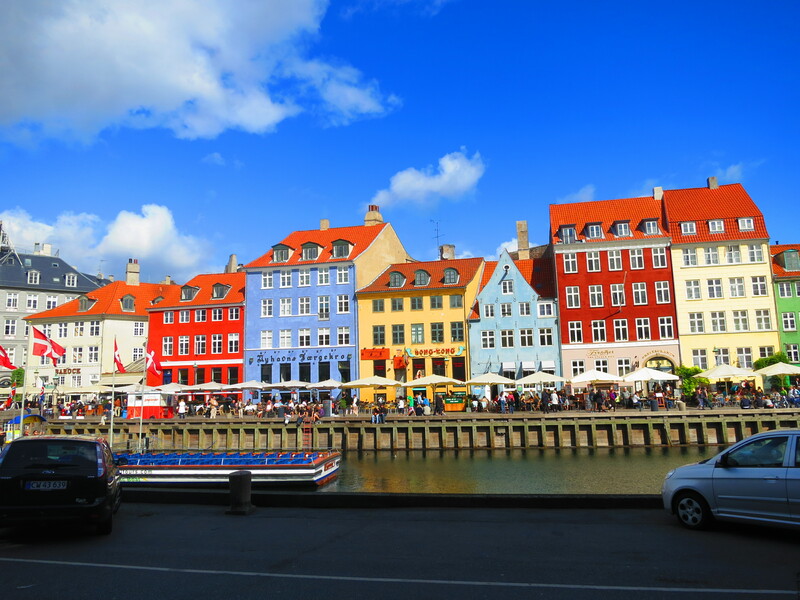 However, if we had to choose and overall favorite, a place where we could see ourselves living, that has delicious food and beer, a place with friendly locals: Copenhagen, Denmark (with Wellington, New Zealand a close second). A surprise, right? It is an all around cool city and we wish we could have spent a little more time there. (I could go for one of those delicious hotdogs right now!) Although after a few days in Munich, it could easily fit the same bill. The truth is, there are just so many great places out there, it is hard to choose! 2. Have you been able to stick to your budget? Absolutely. And not at all. It really depends on the region and the day. When we began our trip, we sat down and created a budget for each region we would be visiting. We have a daily budget and a separate one for nightly accommodations and transportation. We spent a lot of time on this, but really it was all a best guess. We came in under budget for our time in New Zealand and slightly over budget for our time in Japan. Not too bad. We were basically right on budget for Southeast Asia and the Cruise. Then we got to Europe. We found in Europe we easily stayed on budget with accommodations (we allowed $65/night), but our daily budget ($70/day) often was not enough and we found ourselves going over our allotted budget each day (I know this sounds like a lot, but keep in mind it is for 2 people and includes everything from museum tickets to pay toilets). This was especially true when we were with our friends both in Budapest and Dubrovnik. For them, they are on short vacation and they have a different mentality towards spending. Looking back, we should have budgeted more for these sections and thought of them more like a vacation from our trip. We allowed ourselves more for the UK ($90/night, $120/day) and hope we might be able to make some of the overage back while we’re here. The most important thing is that we are very conscious of our spending. I write down everything we purchase in my phone and then transfer it into a notebook where we can tally up the totals. This consciousness is very helpful and much advised for anyone on a trip like this because it is amazing how fast the spending adds up. 3. Are you still having fun or are you ready to go home? We are definitely still having fun and enjoying every single day. However, now that we are one month away from going home, we have started thinking about real life just a little bit more. Not too much, just a bit. There is a lot we miss about home like cooking for ourselves each night and having access to all of our things–clothes, pillows, my hair straightener. We also look forward to being in one place for longer than three days. And oh, a guaranteed good bed and shower each day! But man, there is so much to see and do everywhere we go, how could we not have fun? Each day brings new surprises and we are looking forward to savoring every bit of the last month. But when we get on that plane to head back to the States in November, we’ll be ready. 4. Have you gotten sick of one another? Before leaving, my dad kept joking that he only hoped Phil and I would come back married. Of course, he was exaggerating, but not too much. Another friend wondered if we were worried about spending so much time together to the point where we might get sick of each other. Because so many people voiced similar concerns, we planned on having one day a week where we spent the day apart. We are happy to be travelling around the world, but it certainly isn’t worth risking our relationship. Surprisingly (or maybe not), we haven’t really needed these planned days apart. We haven’t gotten sick of each other yet. Sure, there are times of frustration and we take 20 minutes to go our own way and meet back up. But generally, that is enough. We really like hanging out with each other and are interested in a lot of the same things. We are so happy with how it has worked out and think it definitely bodes well for our future. 5. What else do you have left? After sharing all the things we have done already, people always want to know what is left to do. So, we are currently in Glasgow, Scotland where we will be for a few days. After this, we head to Edinburgh then a tour of the Highlands. We will say goodbye to this part of the world and fly south to our final destination: Argentina. Arriving in Buenos Aires, we will spend almost 3 weeks travelling around Argentina and perhaps even make a visit to Chile. Then, on November 14 we arrive back in Cincinnati, Ohio to the warm hugs and kisses of family and friends. Hopefully, this has answered some questions you may have been having, or at least given you some interesting insight into how we feel about the trip. If there are any other questions, just ask. We are more than happy to share. Now, I must go explore Glasgow! Perhaps a dram of whiskey to get me started! Our wonderfully relaxing and easy-living nine day Baltic Sea cruise has come to an end. The time has come to leave the boat. We started the day with one final delicious breakfast buffet at our favorite spot on Deck 11 of ye olde Norwegian Sun. And, for the last time, walked away from the table without worrying about settling a check or removing a single dish. After docking in Copenhagen, Brooke and I attempted to remain onboard as long as we could but around 9:00 AM the crew pulled us off kicking and screaming. It was quite a scene that disturbed some of the older passengers. In all seriousness, we’ve enjoyed the cruise but we’re ready for what’s next. So, we find ourselves back in Copenhagen for one last day before we close the book on our Northern European leg. Now off the boat and away from the all-English all-accomodating lifestyle, we’re back to the little things being a touch more difficult and occasionally frustrating. Today’s particular challenge was our attempt to spend some time in the local library. We figured a Copenhagen “bibliotek” would be a good place to cool our heels for a few hours, flip through some travel books and hop online. We were able to pinpoint the location, determine walking directions, and check the hours. But what the Danish language website did not make clear is that this funky library is open on Sunday only to library card holders who must swipe their way in via key card. See? Frustrating. Also, please don’t alert the Copenhagen Transit Authorities, but due to issues with the ticket machine, we managed to take a pair of rides on the local trains without forking over a single dime. 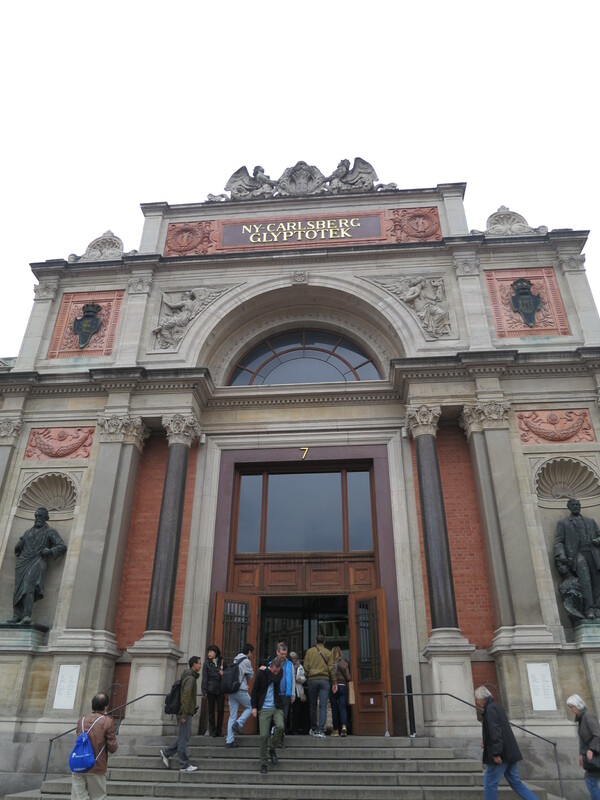 We did manage to make a visit to the renowned Glyptotek museum in central Copenhagen. The museum offers free admissions on Sundays and boasts an impressive art collection started in 1882 by beer baron Carl Jacobsen of Carlsberg fame (see our post mentioning Carlsberg here). Jacobsen also donated, among others, the sea-side dwelling Little Mermaid statue that is forever associated with Copenhagen. We strolled through a handful of the galleries, enjoyed some of the architectural features of the museum building as much as the art and took in some great paintings and sculptures. There was art by Degas, Manet, Van Gogh, Picasso, Monet, Rodin, Gaughin and two dozen other European artists and painters I should probably know but have already forgotten. The sculpture gallery was loaded with marble and bronze creations and was positively great, although I wouldn’t want to be there at night. 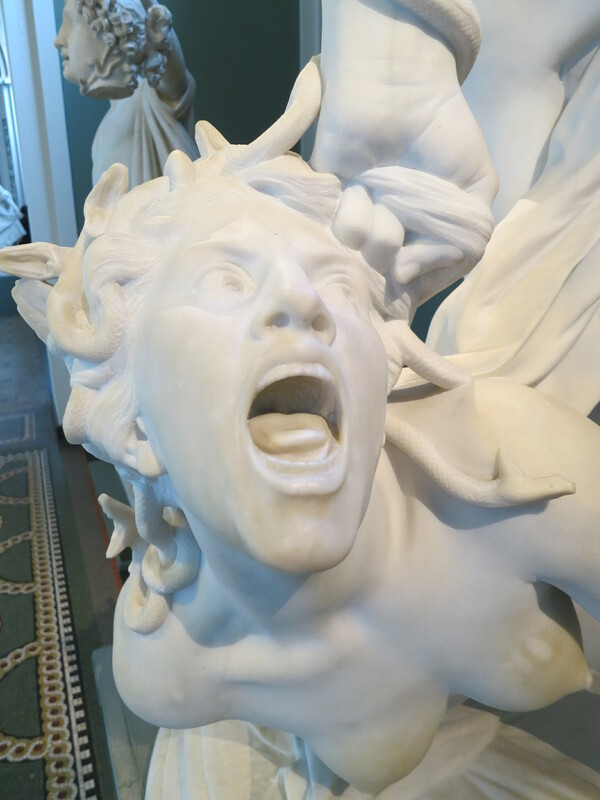 My personal favorite was a sculpture of Perseus severing Medusa’s head in action. 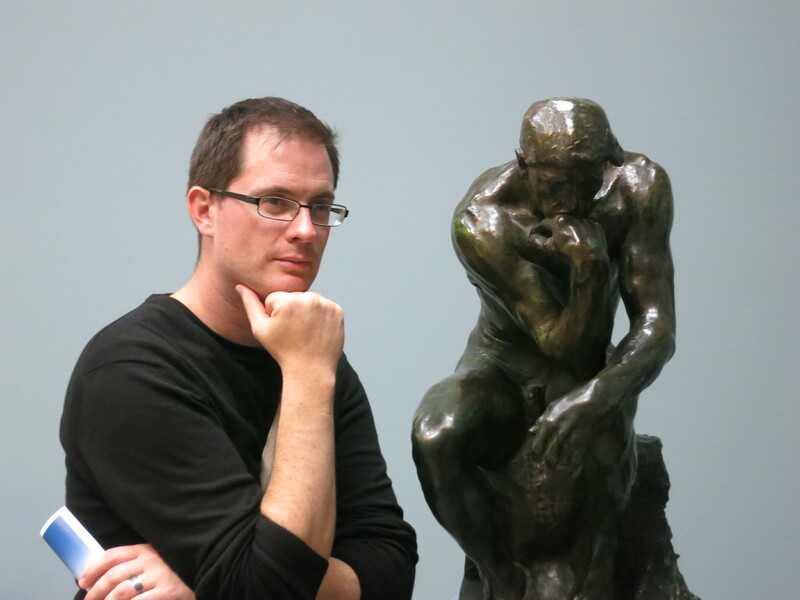 We were kind of thrilled when we saw that the museum was the home of Rodin’s iconic “The Thinker” as part of a comprehensive Rodin gallery. But that was until we learned that there are like twenty other “original” casts of the statue throughout the world. Maybe not as special, but the Glypoteck is still a great museum. Of course, for lunch, we couldn’t resist one last hot dog. 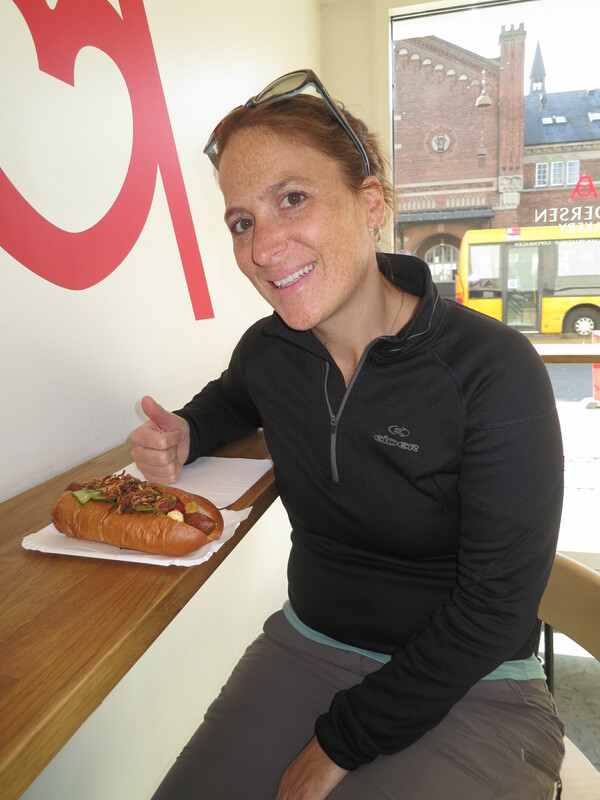 This time we asked around for the best hot dog in the city. We went gourmet with arguably the best deluxe wiener in town from Nimb. These dogs were a bit more expensive, but they delivered the goods. Gourmet taste-bud satisfaction from one end of the bun to the other. 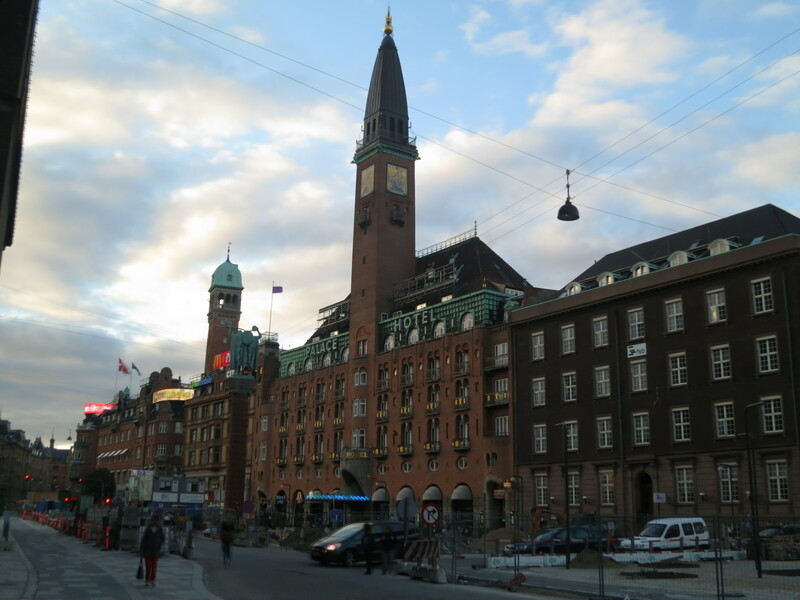 Final impressions of Copenhagen? It’s kind of a great city. Locals give off a vibe of general contentment – they seem especially merry whilst mounted on bicycles. The town is sophisticated, forward thinking and awash in eye-brow raising design. Highbrow, but accessible. Expensive, but doable. The town even managed to surge my own bit of creativity. Growing up, my friends and I used to watch a lot of professional wrestling. We were always coming up with ideas for new gimmicks for the wrestlers to use in the rings. I now have a fantastic concept: The Angry Dane. He’s big, he’s blonde and he rides a bicycle to the ring which he locks to the ringpost once he arrives. During his match, The Angry Dane illegally uses the Bicycle as a weapon against his opponent. The announcers will call that move the “Twelve Speed.” Pure gold. Someone get me Vince McMahon on the phone. Now, we’re off to Romania and Bulgaria as we open the door on our Eastern European segment. We start by visiting yet two more nations that we know virtually nothing about. (As always, we’re open to suggestions!) A pair of flights from Copenhagen to Vienna and then Vienna to Bucharest and yet another quick time change where we jump ahead two hours. We selected a landing spot in Bucharest in part because of it’s Eastern European location in relation to points Westward and in part because, well, it sounded like an interesting place to visit. It’s so cool that this trip has allowed us to point to a strange, new location on a map and just go. By tomorrow, we should have some new insight into yet another town that seems to be begging to be discovered. We’ve already begun reading up on Romania to prep a bit for our visit by taking a sneak peek at the culture, food and airport taxi scams. For the next month, our schedule gives us much more flexibility on where to go and when. Our next scheduled flight isn’t until Mid-October. Little by little, I’m discovering that the world is such a big place, but it is also a finite place as well. Who knows what we’ll see, but the odds are that it will be worth sharing. 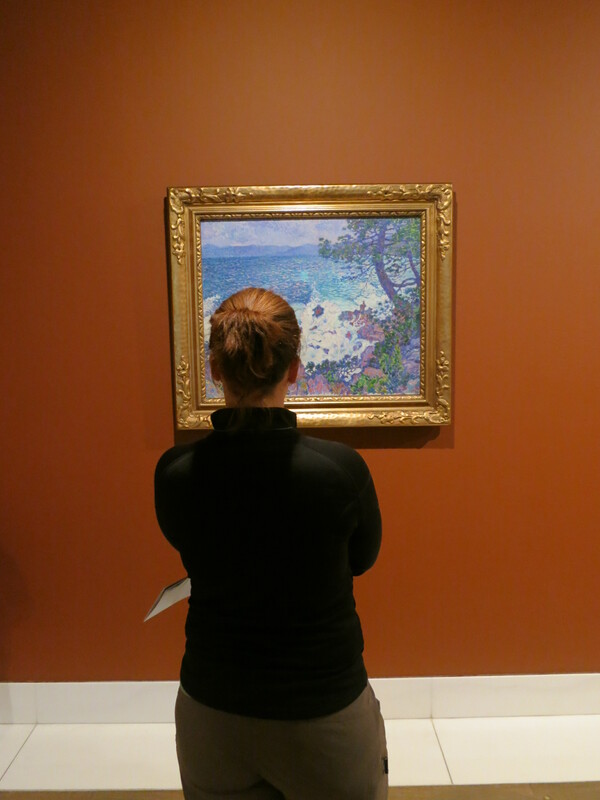 Brooke studying a painting in the Glyptotek’s French Impressionist wing. 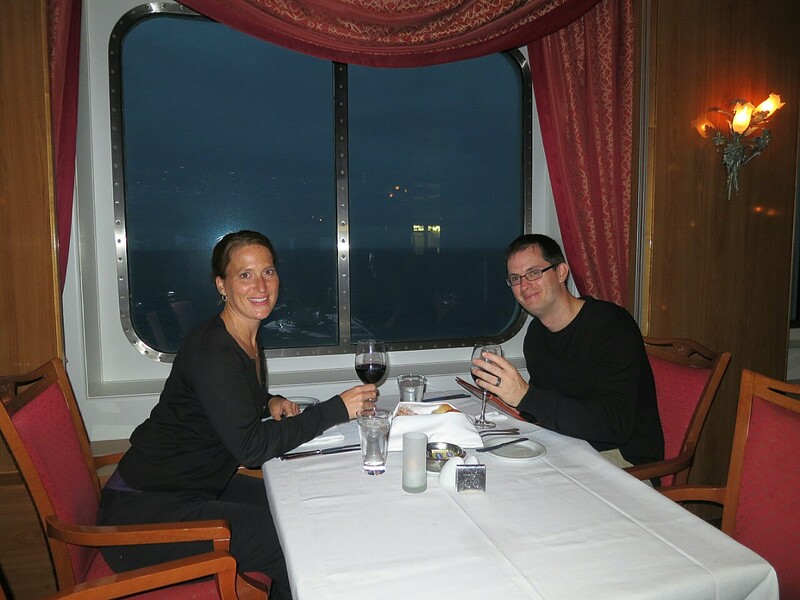 Our final dinner in the Norwegian Sun! Ah, we’ll miss meals like this. 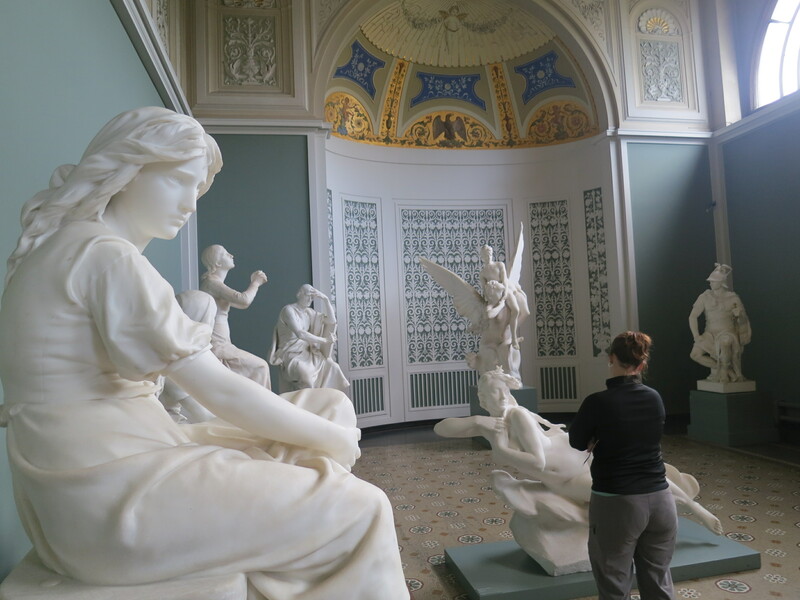 Another look at the outstanding sculpture gallery in the Denmark museum. 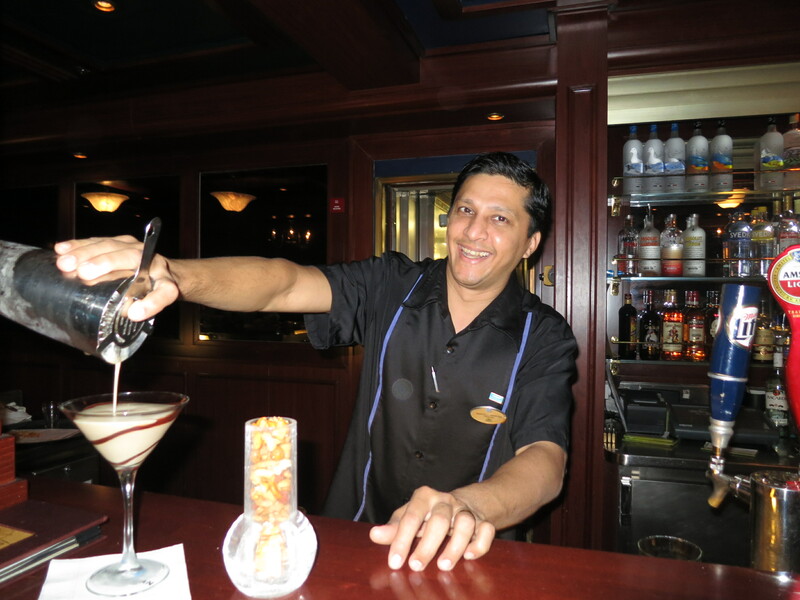 Our exceptional bartender Maxwell from the Windjammer of the Norwegian Sun. He took good care of us many nights. Hello again from Copenhagen! 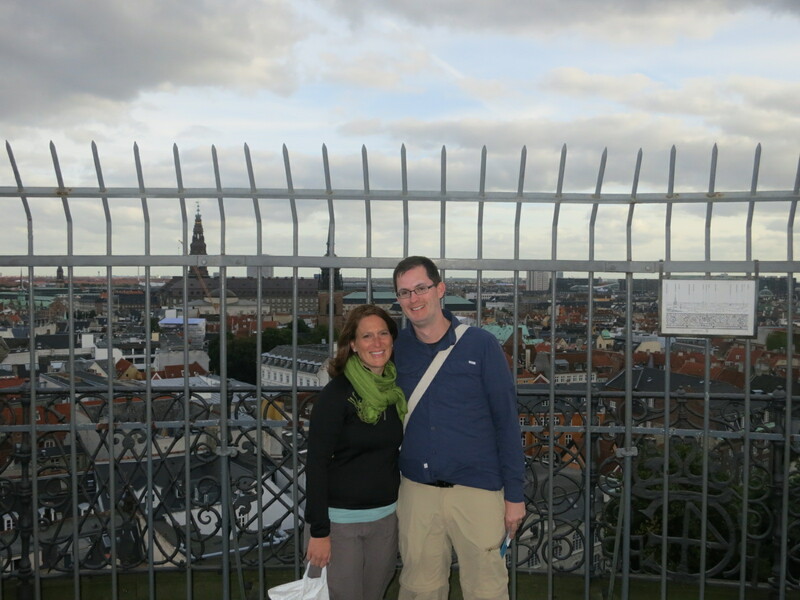 We’ve been lucky enough to enjoy three full days of absorbing Danish culture, food, sights, fun and history. And now that we get into these older European town, there is more than enough history to go around. In keeping with one of the goals of this trip, we continue to see, learn and grow just a bit more each day. 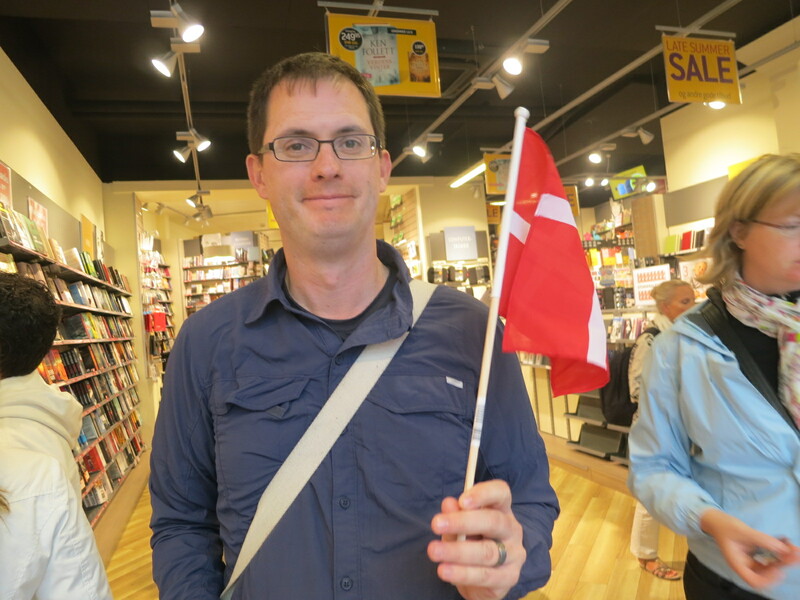 For example, we know now that the Danish flag employs one of the oldest flag designs in the world. And, finally, we’re back in a part of the world that has paper towels in the bathroom. Also, I’m slowly becoming able to sort out the distinct differences between the three Scandavian countries: Denmark, Sweeden and Norway. Until now, all three unfortunately ran a bit together like a jumbled mess in my mind. Since day one, we’ve been resting our head in a variety of different hotels and hostels, but we’ve also had some terrific luck trying out Air BnB- a handy webstie that helps travelers find paid homestays. Currenty, we’re hosted by an incredibly gracious and friendly Dane named Thais who lives a short bus ride from central Copenhagen. 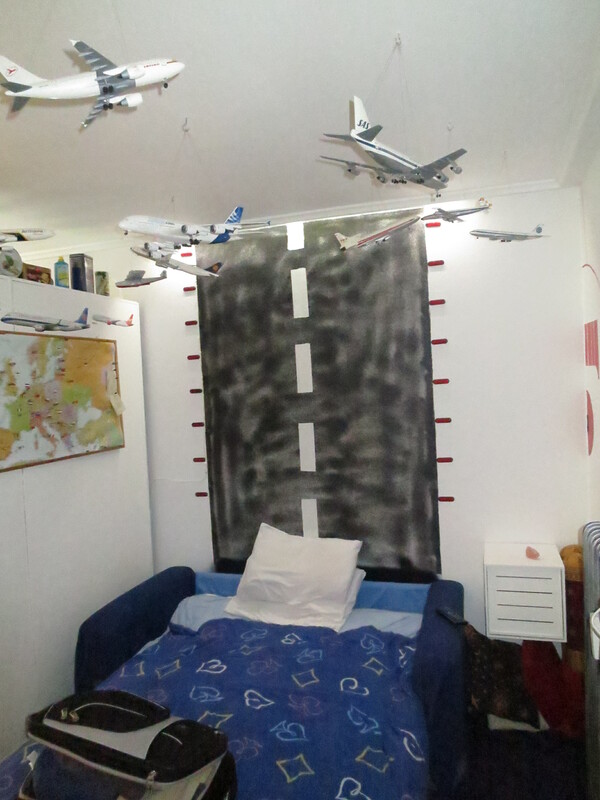 We’re staying in his small, airplane-themed flat for three days; Thais has been a stellar host. His dream is to live in an old airplane, but since he is currently unable to do that, he brought the airplane to his apartment. 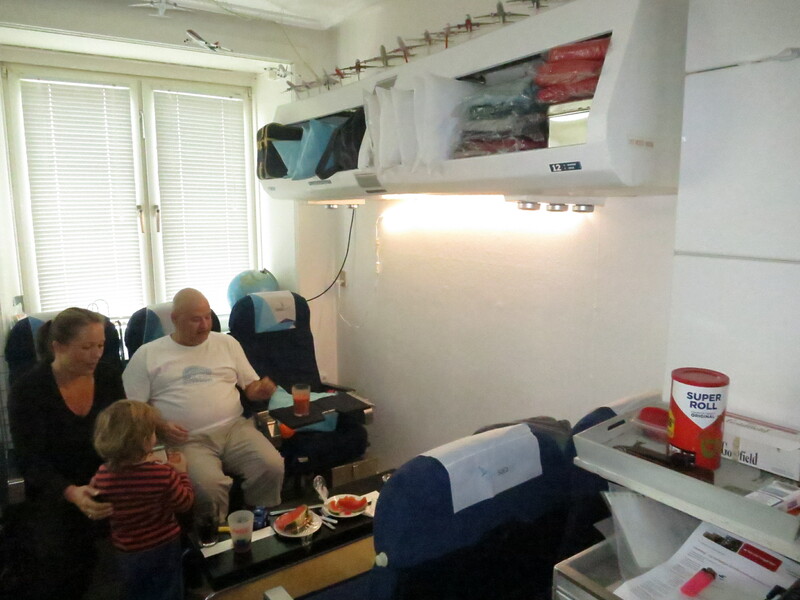 Complete with a safety card that has important information, genuine airplane seats and an overhead compartment for storage, it is clear that he is a bit obsessed with airplanes. It is certainly the biggest theme home we’ve seen in a long time, but it works really well for him! In part, because he is a writer for several European flight magazines, reviewing aircraft, airports and all things aeronautics related. Thais has provided directions, suggestions and even pointed us to a nearby park, Utterslev Mose, where we were run in the morning. Our stay at “The Aerohotel” here has been great and we are glad the weather is finally cool enough (55-65 degrees) for us to run again. Today we began with a tour of the Carlsberg Brewhouse and Museum. Until about a week ago, I though that Carlsberg (along with Heineken) was a Netherlands based beer. Wrong again, Phil. Turns out that not only is Carsberg one of Denmark’s biggest exports and industries, they are also the world’s 4th largest brewing company with over 500 brands including acquisitions of other European beers. While not that big in America, bottles and tap heads were common throughout Asia. 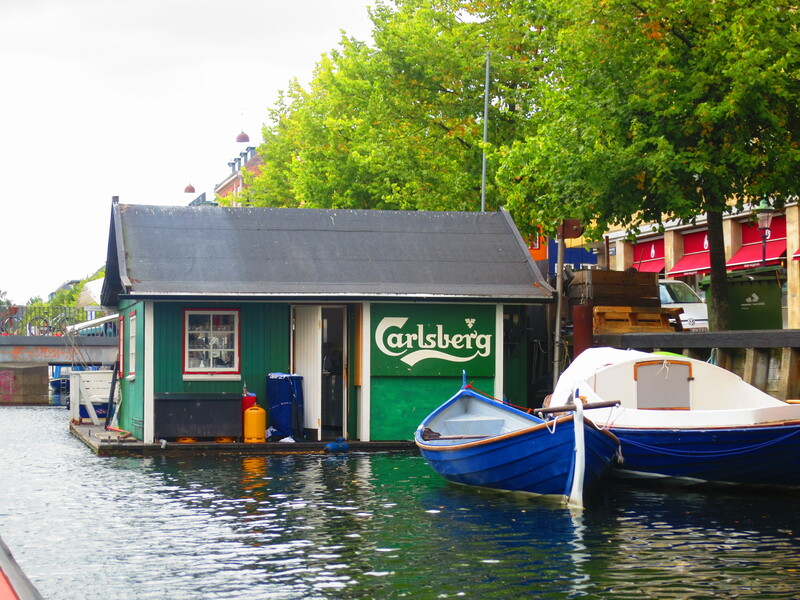 The self-guided eleven dollar tour of Carlsberg (the etymology of the beer’s name is the combination of the name of the owner’s son and the Danish word for hill) was well worth it. The fact that the price of admission included a few beers didn’t hurt. 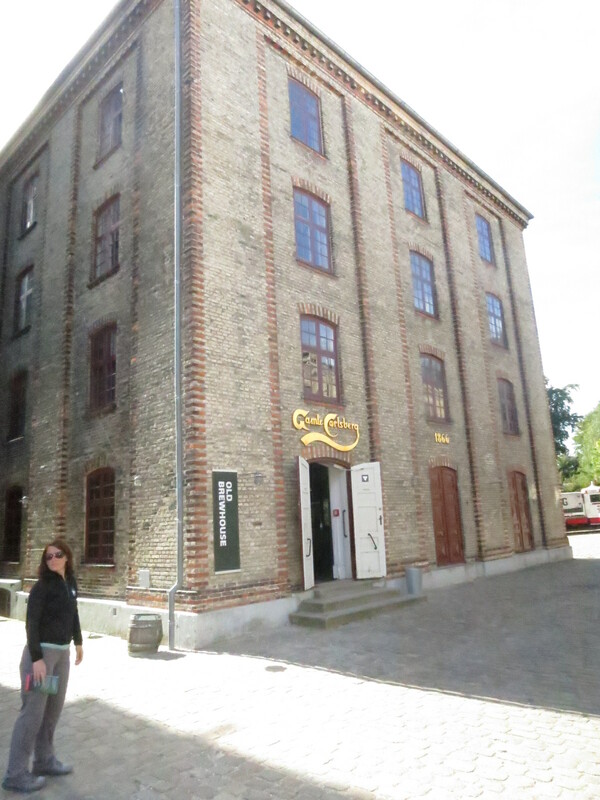 While most of the main brewing facilities have been moved to the Jutland area of Denmark (just don’t ask us to point it out on the map), the company headquarters go back over a hundred years with plenty of well-perserved buildings that show off an interesting history. I found some of the exhibits on the well-organized Carlsberg tour more interesting than some at the National Museum. The tour took us through that stables that are home to the company’s remaining Jutland Horses. This stout, large and somewhat rare breed, which resemble the famous Budweiser Clydesdales, were historically used to pull beer carts throughout the city and are still used in ceremonies today. 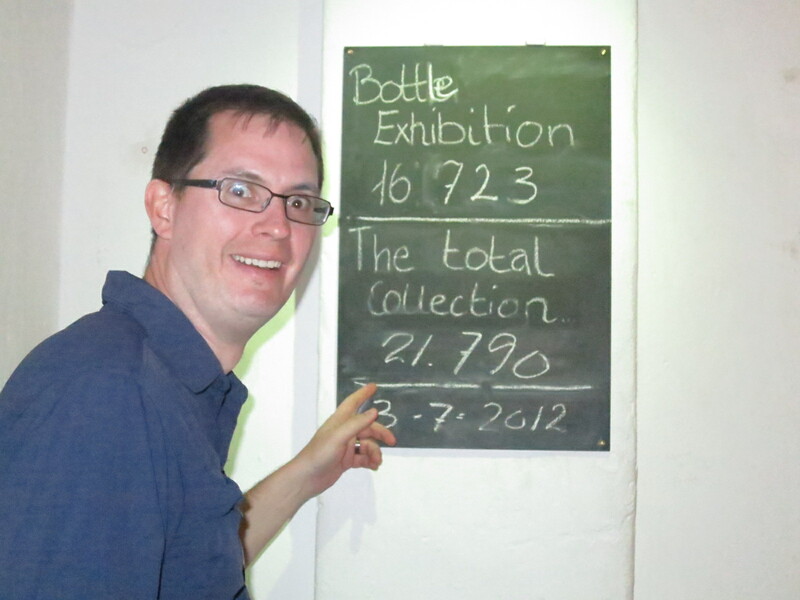 The museum also houses a collection of 22,000 unopened beer bottles from the last couple of hundred years! 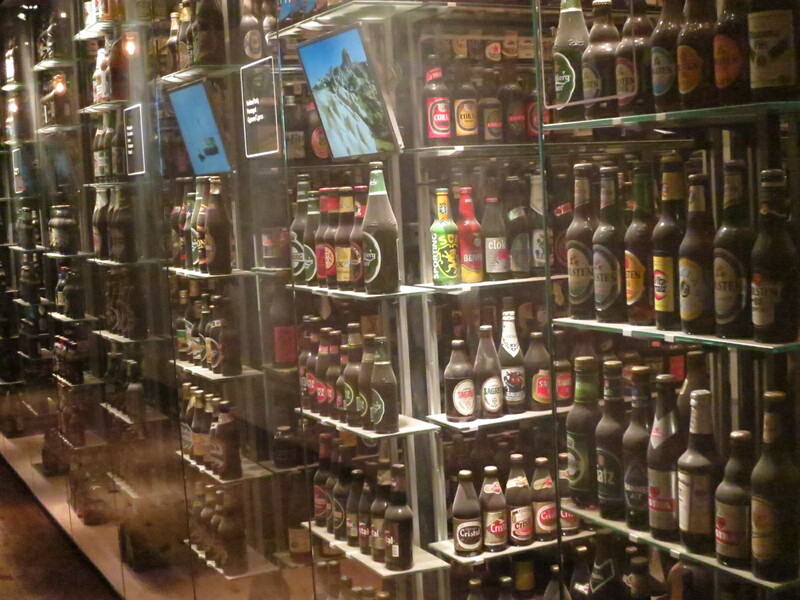 22,000 glass bottles, many donated from one Dane’s private collection, placed carefully on glass shelves in one room! Good thing we’re not in an area prone to earthquakes. They also really have kept their original buildings in wonderful shape to illustrate the brewing life back around 1900. The trip out there was worth it alone to see the entry gates complete with giant elephants and to watch the modern day brewing of small batch Jacobsen’s Ale while perched from an upstairs bar. 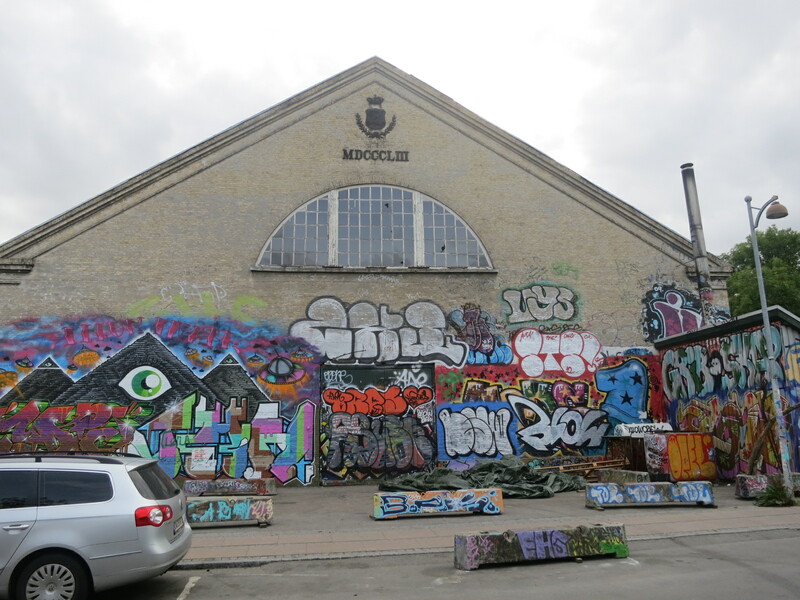 From Carlsberg, we took a trip to the famous Freetown Christiana: an area of Copenhagen that has been occupied by squatters on an old set of military barracks for more than 40 years. Christiana is intended to be an open commune where anyone can live and designed to encourage artists and foster free thought. But our reality was that it looked more like a bunch of burned out hippies sitting among sub-par graffiti art splattered across random buildings. The central draw is the Greenlight district or Pusher Street where they sell weed- lots of weed – openly. Just don’t take out your camera while nearby. Christiana residents declare themselves as not part of the E.U and eschew taxes, but they still receive city services such as mail, electricity and water. It has a long, complicated history and apparently the city officials conduct pre-announced raids from time to time. But for the most part, everyone is allowed to just occupy this space without much resistance. Visitors are welcome and a happy community of about 900 live carefree and proud of their little neck of the woods. It’s…odd. After a worthwhile visit, we left with more quetions then answers. We have determined that squatting is handy when you have an entire complex of well kept old buildings to live in and no one is going to kick you out, but even with understanding some of the turbulent past and issues, were still surprised that this large chunk of land is just allowed to be occupied unpaid by a collective mass. 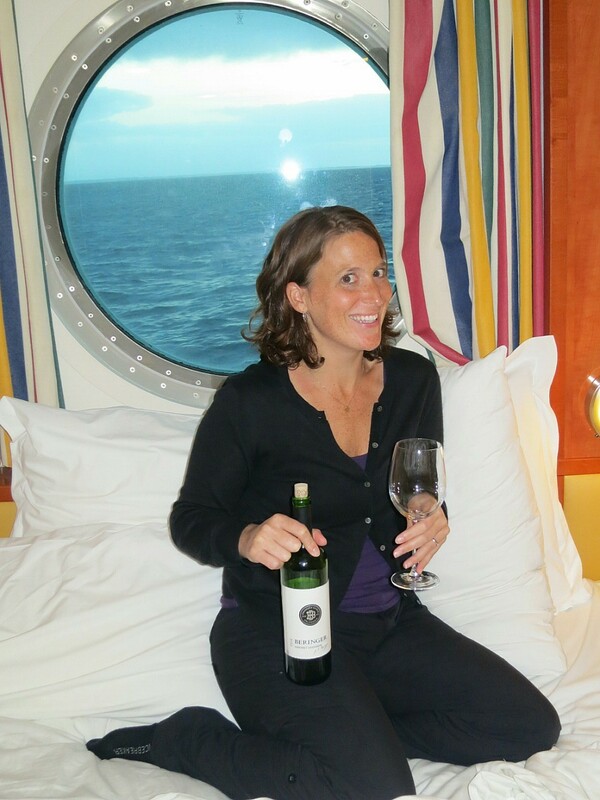 As we wrap up Denmark for now, note that starting tomorrow Brooke and I are embarking on the most luxurious and relaxing part of our round the world trip- a nine-day Baltic Capitals cruise on Norwegian Cruise Lines. Whilst we sail the open seas, we’ll have considerably limited internet access. For the next little bit, our blog posts may be intermittent as wifi becomes available. Off to Germany, Estonia, Russisa and beyond courtesy of the Norwegian Sun! So many bottles at Carlsberg! Another photo from Thais’ Aerohotel! Ah, just two days in Copenhagen and we already feel like we’re fitting in. I think we’re ready to be issued our bicycles now. Each day, scores of blond and blonder fit Danes ride their bicycles past me with an inviting arm outstretched asking for a high five. Or they might just be signaling a left hand turn. I’m not quite sure. I know Brooke mentioned it before, but the amount of cycling as a means of transportation is inspiring and stunning. Eveywhere you turn, there are dedicated, large bike lanes spanning a flat terrain full of polite cyclists scooting about town. We’ve also seen a couple of guys on roller skates, but we’re pretty sure that just means that their bikes are in the shop. 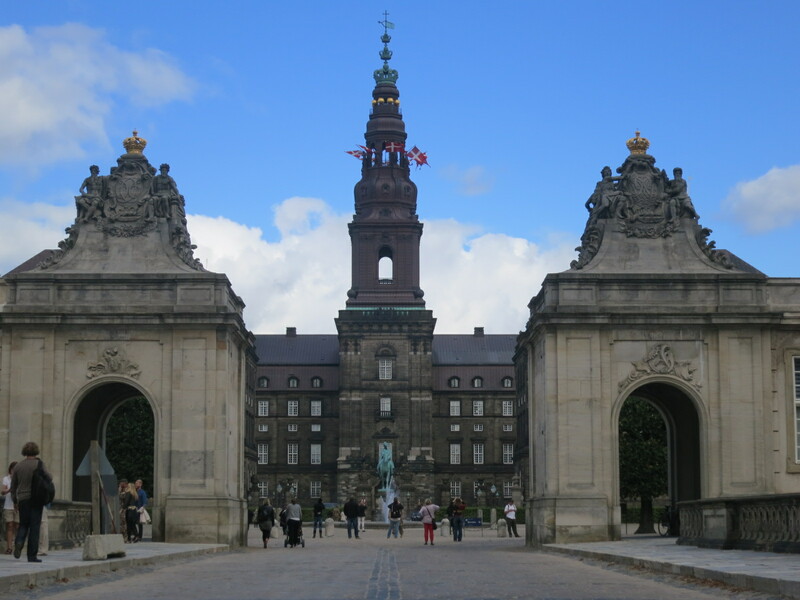 Thus far, it’s been a blast exploring Denmark’s capital city. It’s a compact area with a sea of orange, slanted roofs and low rises that emit both an old and modern look. In one small area alone, you can walk the serpentine path to the top of the nearly 400-year old Round Tower, shop in a late 19th century storefront or stroll past the modern “Black Diamond” – the striking Royal Danish Library. The city is entirely walkable with (yet another – we’ve seen so many) stellar public transportation system comprised of buses, regional rail and an expanding subway. 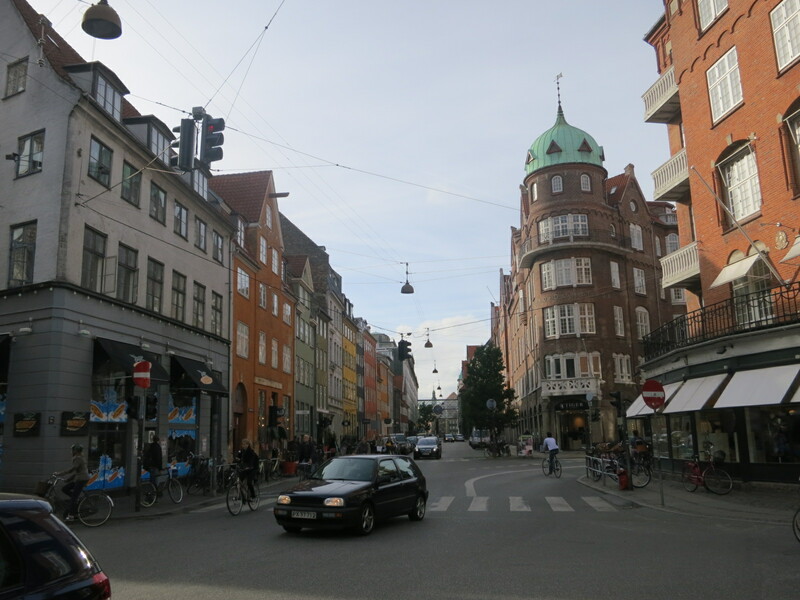 It’s easy to think of Copenhagen as a sophisticated, classy, old-world city. Clean, organized, and cultured. As for the locals, I think that the best way to describe the people we’ve met is engaging. Once you a start a conversation with anyone from the bartender to the guy on the bus, everyone is talkative and eager to share. It doesn’t hurt that just about everyone speaks English incredibly fluently as a second language and many speak a third or even fourth language. Reading scores in Scandinavia are higher in general since virtually all television is in English with closed captioning in the native language. Hence, the country’s youth is often reading while watching television. We realize that reflecting on the food is becoming a common motif in our blog, but some delicacies are too good not to share. If there is one thing Copenhagen does well it would be bakeries. 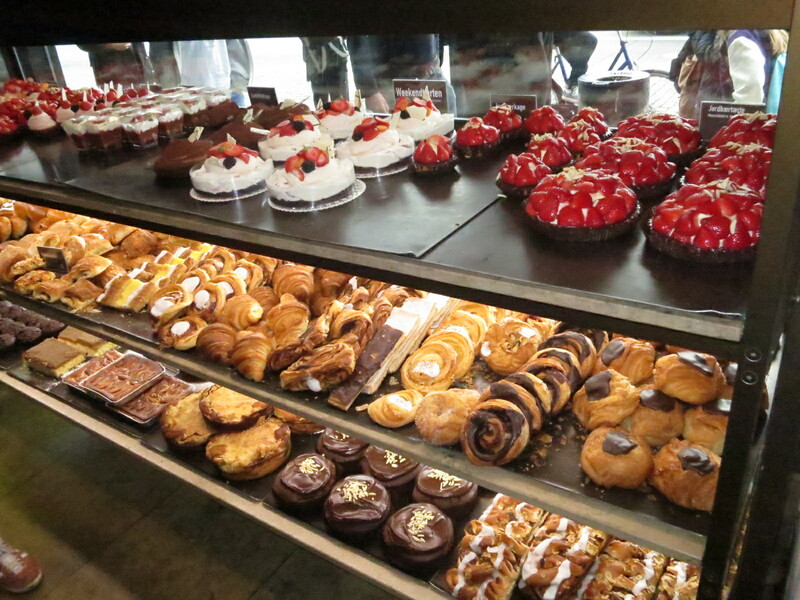 Storefronts loaded with freshly baked pastries, breads, tarts and more are almost as common as ads for Carlsberg. We’ve sampled the ware and they deliver the tasty goods. We also sampled the national mid-day lunch dish – Smørrebrød (don’t worry, we can’t pronounce it either) which is essentially an open face sandwich made of everything from meatball and pickled cabbage to roast beef. Available everywhere, we stopped in an unassuming lunch place to give ’em a shot. Delicious! Only problem was that we didn’t know the custom is to order two or three since they are a bit on the smaller side. Learning as we go. 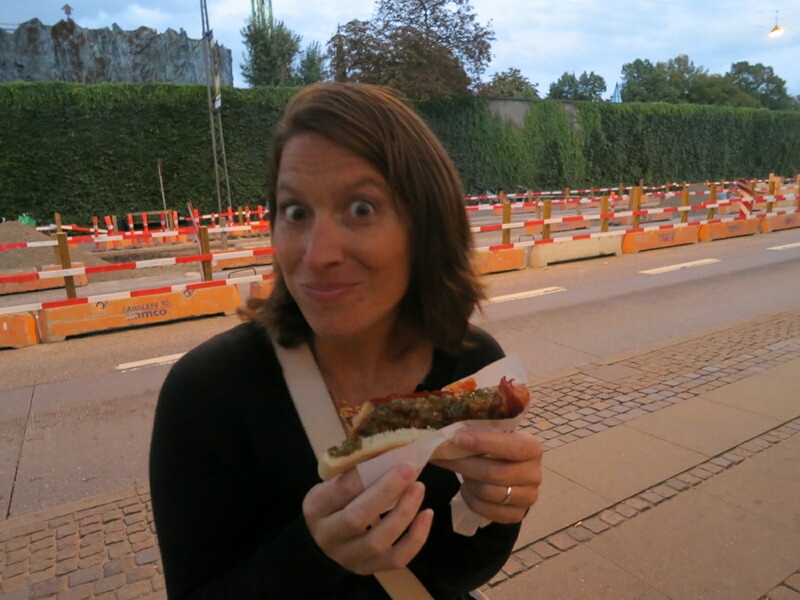 Another sensational “local” dish we discovered is, believe it or not, hot dogs from a street vendor. In a land known for sausage, this is some of the best street meat we’ve had in months. Large, mouth-watering sausages wrapped in bacon loaded with condiments? More, please. These put (most) NYC hot dogs to shame. And, yeah, we’re going back for another round today. Copenhagen also lays claim to the “World’s Best restaurant” – Noma. How is it? Amazing and delicious…are the words that a world traveler who could dream of being able to afford to eat there might. 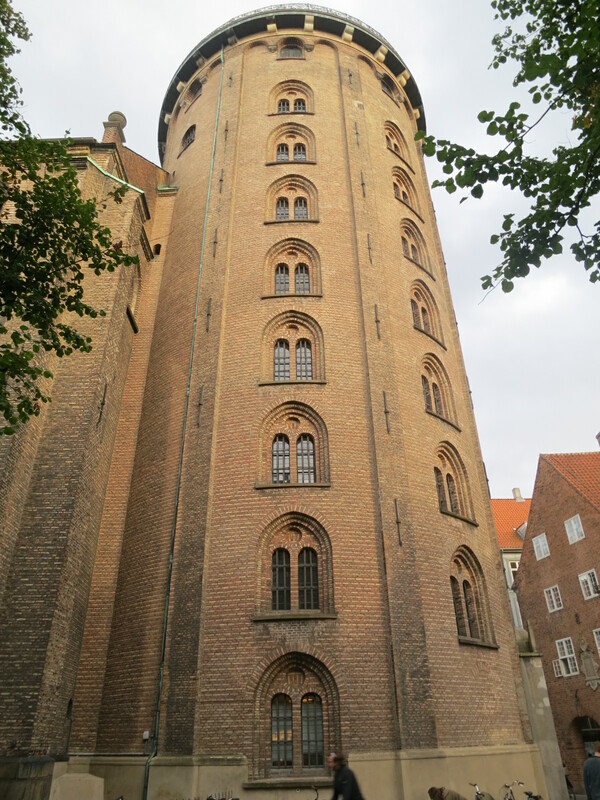 There is so much more to tell you about Copenhagen. Next time we’ll share stories of the Carlsberg Brewery, Christiana (the incredibly interesting community of squatters), and our amazing Air B ‘n B experience. The Rundetarn- or Round Tower- build in 1642 as part of a church and observatory complex. Very, very cool walk up. There is no mistaking it…we are NOT in Asia anymore. From the moment we stepped off the plane and every moment since then, it has been quite clear we are in an old European city. 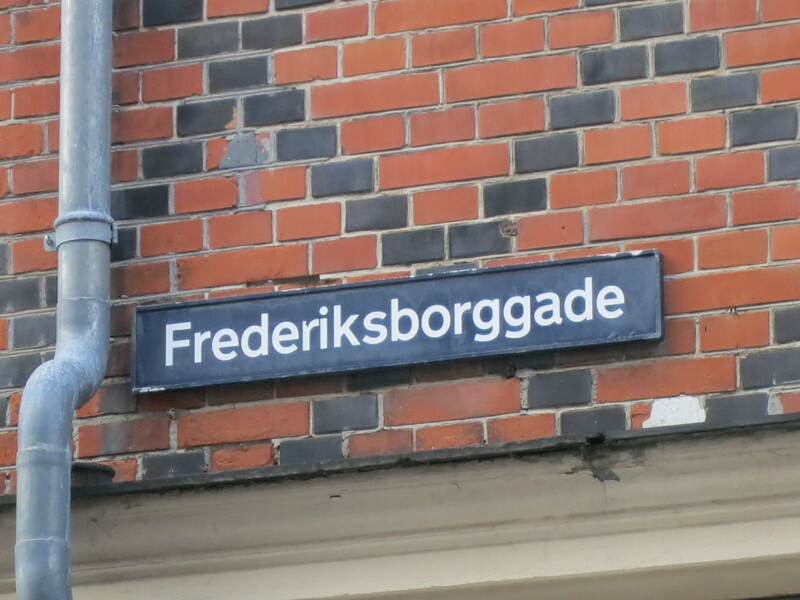 But even more than that, it is clear we are in Denmark. Everywhere we look there are beautiful blondes riding bicycles (very politely, I might add). After a short morning run, we truly began to explore Copenhagen. Going off recommendations, we started our day with a canal cruise. This hour-long cruise through the winding canal system was a great way for us to see several different areas of the city so we could then determine what we really wanted to visit. When the tour-guide began speaking German, we were afraid we had gotten on the wrong boat. We checked to make sure the tour would be in English, but she definitely wasn’t speaking English. As it turned out, she gave all the information in three different languages–Danish, German and English. We were relieved we would be able to understand, and again felt awful about the fact that we seem to be the only people in the world who only speak one language. As for the tour, we especially love looking at the architecture of the city. They really take pride in their old buildings, some of them date back hundreds of years. However, they also have a lot of new construction, including an opera house right on the water which was built less than ten years ago. Because of this, the newer buildings really have to be spectacular so they can stand the test of time. Unlike Tokyo or Hong Kong, there is no race for the tallest towers or highest buildings. In fact, there are very few skyscrapers in sight. As we walked the streets, we kept saying that it all looks so European–old, grand, brick buildings lining the street, some with huge squares in front where people gather. It is exactly what we pictured before we got here. 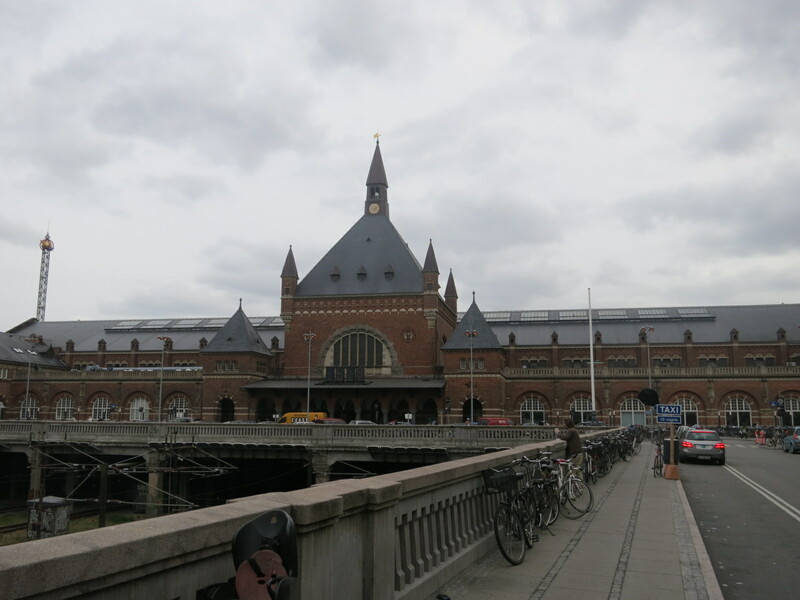 The riverboat cruise inspired us to head to the National Museum so we could understand a bit more about Danish history. As we walked over there, we saw a crowd gathered outside an old church. Today was Flag Day or Soldier’s Day, so there were lots of celebrations and officials about town. There were clearly secret service types outside of the church, so we thought we might glimpse the prime minister. As it turns out, they were waiting for the Queen (Queen Margaret) to come out. Apparently this was her private church and she was inside. The royal family here seems to be fairly accessible to the people. Of course, they are guarded, but people can walk the palace grounds and the royals are often spotted about town. We waited for a bit to see Queen Margaret, but as it seemed like she wasn’t coming out anytime soon, we continued on through the Parliament grounds and over to the museum. The National Museum (Nationalmuseet) has a completely free admission and is rather large, consisting of exhibits from the beginning of time through the year 2000. That seemed a bit overwhelming to us, so we started with Danish pre-history through the Viking era. Intermingled with the exhibits discussing burial rituals and ancient tools were art pieces that provide a “modern interpretation” of history. Clearly the Lego version of the Deathstar from Star Wars was a piece of art. Unfortunately, they were not all so clear and we found ourselves incredibly confused about what was real and what was art. We questioned the exhibit showing the grave of the “bog witch” who boiled diseased children creating a dense fog over the bog. However, it was the mermaid that really made us confused. 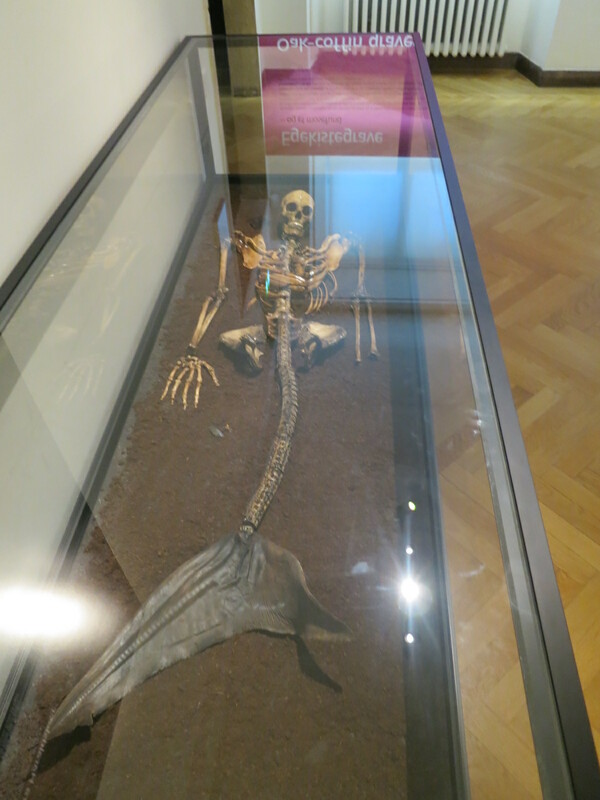 Laying in a case are the bones of a mermaid with the story of a man who dug her up while tilling his farmland. We looked at each other, completely unsure of what was happening. We know mermaids aren’t real, but was the story real? Had someone placed bones together to make it look like a mermaid and trick the farmer? We backtracked down to the information desk to figure out what was happening. The woman working at the museum was not at all surprised by our questions and confusion. She cleared it up…kind of. Bog witch–fake. Mermaid–fake. However, they are next to other very real graves which are genuine museum exhibits. She told us these artists are “interpreting history in a modern way to push the limits of our thinking.” I think that is complete garbage and they should say instead they are creating mythology to go along with the history. It is far too confusing to figure out what is real and what is made up. If a seven year old kid walked through there, he would walk out thinking Mermaids are real. I don’t think that’s what they are going for. After feeling completely confused and like I had just wasted an hour, we scrapped Danish prehistory and learned about more modern times. It was interesting to learn of their history with Sweden and Norway as well as the other countries in the region. There is so much history and it was all jammed so closely together that it got to be a bit overwhelming and we found ourselves skimming through parts. In more modern times, the history is quite similar to the America– Industrial revolution, child labor laws, women’s rights, etc. With all of this culture and history under our belts, it was time to learn what Copenhagen was really all about and we figured the best way to do that was to find a good bar. Amid the cutesy cafes and upscale bars in a rather touristy part of town, we managed to find Lord Nelson, a basement bar specializing in craft beer filled with locals and regulars. Our friendly brother-sister bartending team, Morton and Ricki, were awesome. Not only did they let us try every beer they had on tap, they encouraged us to branch out our tastes and go with beers we might not normally drink. We both enjoyed the Kiss Me Hardy, a delicious hoppy beer named after Lord Nelson’s final words to his First Officer. Through this discussion of beer, we also learned a bit about Morton’s favorite places in Copenhagen and a little bit about life here. We also talked for a long time with Perm, an older gentleman who has traveled the world and was excited to talk to us about all the different places he’s been. We asked lots of questions about the relationship between Denmark and other countries and truly learned as much there as we did at the museum. 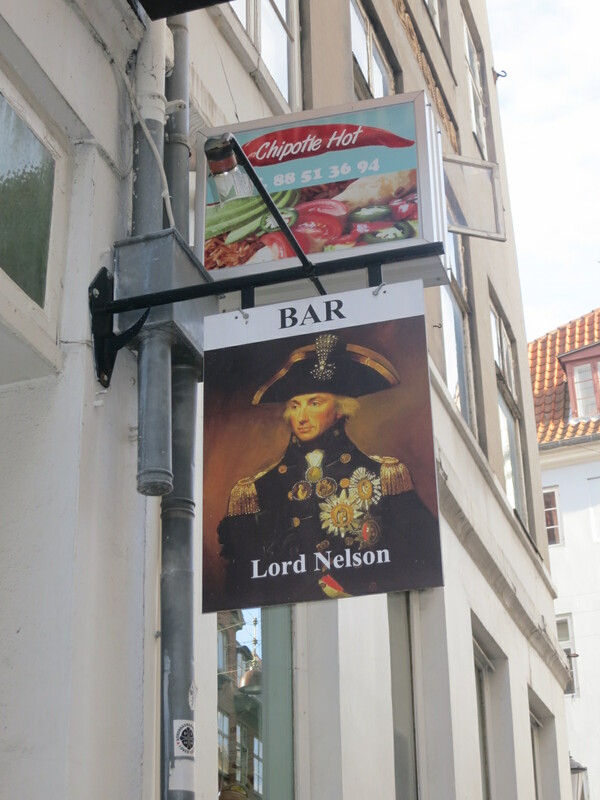 Lord Nelson is exactly the kind of bar we’ve been looking for and we were happy to spend a couple of hours resting after touring Copenhagen. 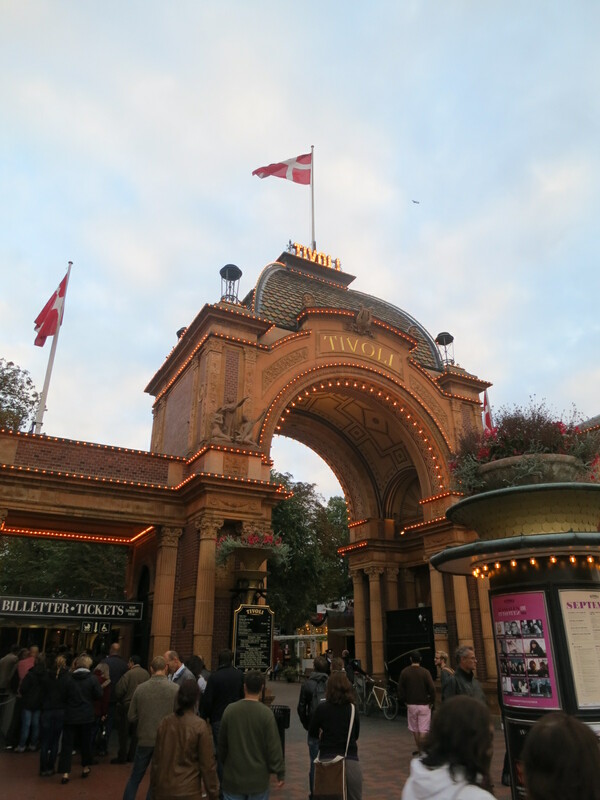 We managed to drag ourselves away from the bar so we could head to Tivoli, one of the oldest amusement parks in the world, known for its beautiful lights and gardens. We know it for being a huge disappointment. We had to pay to get in, which we figured since it is an amusement park. However, we had to also pay to do anything inside. Rides, restaurants, games–everything cost additional money. We walked around, unimpressed, and left thinking we could have spent our money much more wisely. Oh well. We were tired and ready to head home anyway. Our first day in Copenhagen was a roaring success and we can’t wait for tomorrow. We plan to hit the Carlsberg Brewery, Christiana and eat lots of delicious pastries. We look forward to sharing what we find! 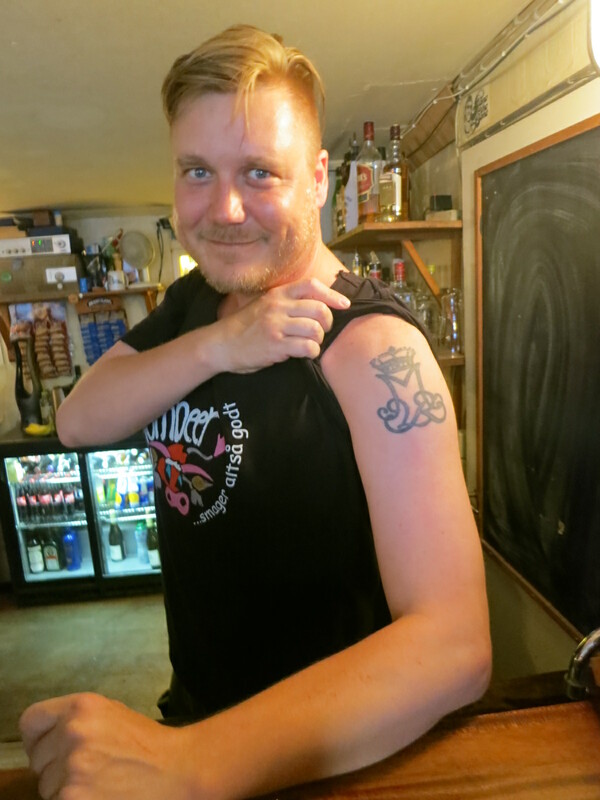 Morton, our awesome bartender at Lord Nelson’s, showing off his tattoo from his time in the Queen’s military. Here’s a bar right on the canal where boats can pull up to have a drink. 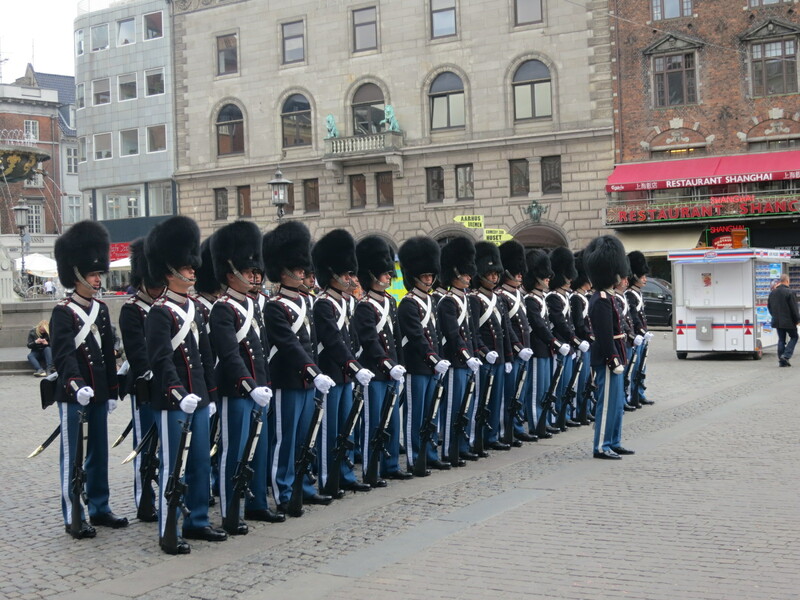 Royal Guard lining up for Flag Day events. A typical example of the beautiful buildings that remind us we are in Europe. Well, we’ve reached a small milestone on our Round The World trip. Today, we officially close the book on the Asia and Pacific portions of the trip and head west to Northern Europe. We’ve got some amazing photos, sensational stories and our passports are starting to fill up with stamps the colors of the rainbow. The list of countries we’ve visited so far includes New Zealand, Japan, China, Hong Kong, Vietnam and Singapore. Not too shabby. We have some mixed feelings about leaving Asia. We’re pumped to see what we’ll get up to in Copenhagen (and eager for any suggestions! ), but it’s a bittersweet ending to our time in that section of the world. We sort of fell in love with several of the places we visited and wish we had a bit more time to explore and dive in. So, I guess that just means we’ll have to plan a return trip down the road. One thing is for sure: it will be nice to get a break from the heat! Now, we fly halfway around the world (again) on an overnight flight in business class on Air France from Singapore to Paris and then Paris to Copenhagen. Monsieur! Monsieur! More Champagne, si’l vous plait! Time for a new country, a new region and even a new continent but that also means, sigh, so long Asia. We also wanted to say a huge thanks to everyone who has been checking out our Luggage Tags travel journal. It’s great to be able to share our big trip with our friends, family and the world and we’re thrilled that people seem to be digging it. We seem to gain a few new followers every day. It’s been cool to watch the blog grow and we get a kick out of each comment someone leaves (we do our best to respond to each comment!). As a reminder, if you are so inclined to follow the blog or get an e-mail when we post our daily update, you can click the link in the column to the right to follow. As we shift gears on our trip, we thought we’d shift gears on our blog by posting some of our favorite video clips from the last few weeks shot with our trusty Canon S100 digital camera. (Sorry e-mail subscribers – you’ll have to click on the images to open up a new page). If you want to see any of our past videos, you can click here to see all of our videos on the You Tube page. As always, we can’t wait to see what’s next! Some of you may remember AIESEC from when you were in college—this was the organization where all of your friends who love to drink would host (party with) the foreign students who were studying at your university. They also went on a lot of awesome trips abroad—again, mostly as an excuse to drink beer from many different countries. Lucky for us, not only does being a student garner these benefits, so does being a teacher. Okay, so it isn’t quite the same as in college. 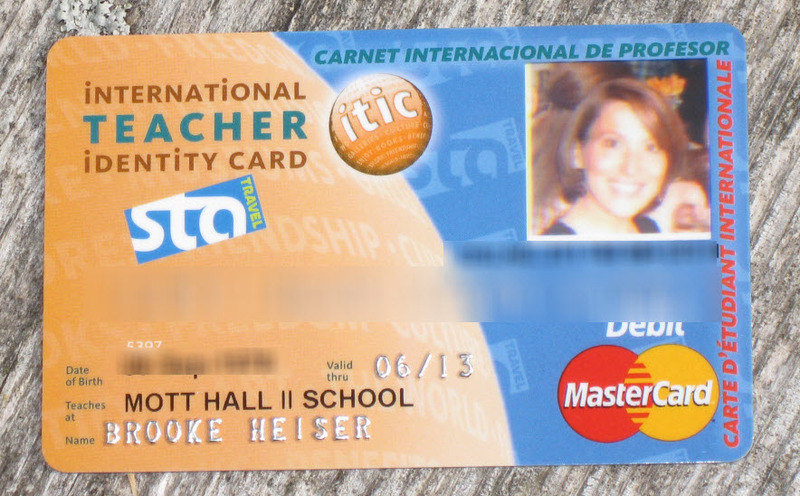 For our RTW trip, I have procured an International Teacher Identity Card (ITIC). The ITIC the grown up version of the ISIC and the similar AIESEC . In order to get this card, I had to go to STA Travel, prove that I am currently a full time teacher (I failed to tell them that I was quitting my job for my travels), and pay a measly $25.00. After a couple of weeks, voila! My card was in the mail. It is proof that I am a teacher and in many places around the world, they actually respect and revere this profession, therefore offering a wide array of discounts and opportunities. Many museums and major tourist attractions offer educator discounts and there are even occasional discounts on transportation. Since we’re traveling on a budget, we’ll take any discounts we can get! It can be used as a pre-paid MasterCard. We aren’t planning on using it in this way because we have other ways of accessing our money. But we could load money onto this card and access it easily from any ATM or use it like a credit card. The ITIC offers a very small amount of travel insurance that comes along with having the card. It is not our primary source for travel insurance, but it offers some nice supplementary coverage. It is yet another form of photo identification that could be used in place of something else. 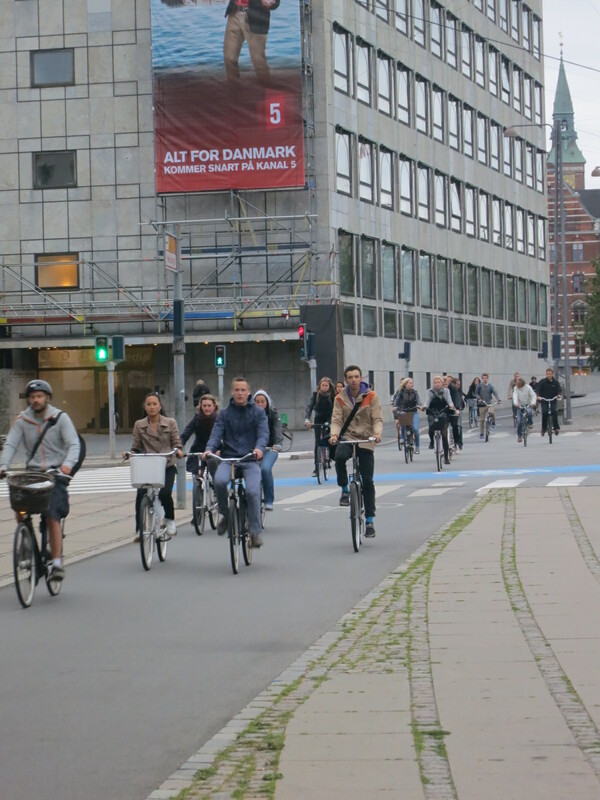 For example, if we rent bikes in Copenhagen and have to leave ID behind to ensure we return the bicycles, we could leave this rather than our driver’s license or passport. The thought of leaving those makes me a bit nervous. Really though, what I’m hoping this card will help me do is to talk my way into different schools around the world. 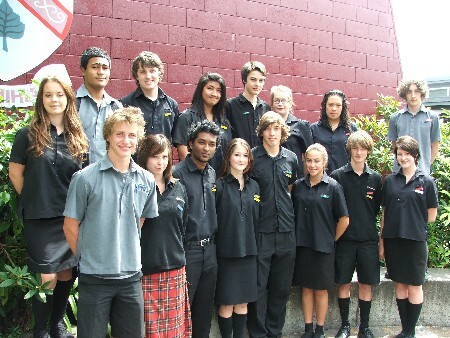 It will be proof that I am a teacher and make me seem like less of a weirdo when I go barging into some middle school in New Zealand asking if I can observe a class or talk to some of their teachers (after all, New Zealand is ranked #2 in the world for reading scores…I could learn so much). I am so excited by the prospect of seeing other schools and meeting other educators. We will be visiting my cousin Gaye, who has been teaching middle school in Japan for the past 30 years. Her first day of school is while we are there. Sure, she teaches at an American Air Base, but still: how cool to see their beginning-of-the-year routines. Hopefully my ITIC card will help me get my foot in the door!